The staff was welcoming, the rooms were clean and comfortable, and the rooftop deck was beautiful! A convenient location to get to the water, the bustling streets, and the market (right outside the door) all by foot. I would definitely stay here again and would recommend the hostel to friends. 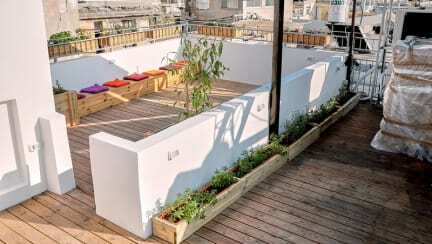 Very nice, clean, modern and cosy hostel with a beautiful view over Tel Aviv. This is the nicest hostel I've stayed at in recent memory. It's scrupulously clean, with everything in excellent shape. New, clean fridge in the kitchen, the bathroom fixtures are new, and the bedrooms feature large lockers, with each bed having its own socket bank, shelf and reading light. The bed covers are warm duvets and the air conditioners in each room are brand new and work amazingly. The rooftop patio and sitting area are a great touch with a great view. Also, the location can't beat! My friend and I ended up in the guest house which was clean and spacious. The location is great; nice area close to a colorful market. The breakfast is included and is great: a very generous bureka filled with different flavor. I totally recommend it. Good spot. Breakfast was good, the beds are good, the staff is nice, the rooftop and kitchen area are good. WiFi is good. Overall a good place. I’d stay there again if I’m back in town. The wifi was terrible upstairs. Outstanding location but Pepo leaves a lot to be desired. Common areas are outdoors only, which doesnt work in the rain. Wifi was terrible and staff is not in-house. 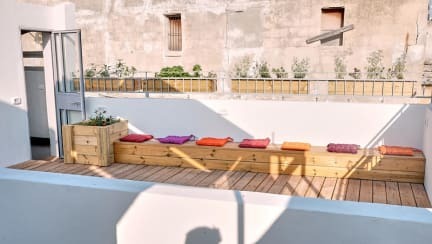 For such a small hostel it was also unfortunate that a few guests seemed to be living in the hostel long term rather than just stopping through for a few days.